Last week I spent a lot of time at my parents house. With my Granny passing away late in July, there were a lot of arrangements to be made and visitors coming through. As is traditional in the South with churches, a lot of people brought food to my family to help out. One family brought over a hash recipe they had first had at Silver Dollar City. While I thought it was a tasty enough dish, but knew that it was chock full of fat and well, not so healthy things. As a result, I created this Roasted Chicken Sausage & Potato Hash for dinner over the weekend. Not only is it much healthier, I found it to be a lot more satisfying. In medium skillet, heat 1 tablespoon olive oil. Remove from heat. Let rest for 5 minutes. Slice sausage into ½" pieces (may still be a little raw on inside). Mix together with potatoes, peppers, onions, seasonings and sausages and remaining olive oil until all are well coated. Pour onto prepared baking sheet. Bake for 12 minutes at 375 degrees. Remove from oven and use spatula to stir or turn mixture to help brown and crisp evenly. Bake for additional 8 minutes at 375 degrees. Only 6 Weight Watchers Points Per Serving! This hash is not only much tastier, but it is definitely much healthier. Using a low fat sausage, just a little oil instead of the butter laden variety we were served last week made a huge difference in the calories of this meal. Roasting the potatoes, onions and peppers gives this dish a much richer flavor. Yes, we are huge fans of roasting our vegetables. The crisping that happens just adds a hint of flavor that makes them so much easier to eat for the kids. While we used organic vegetables and a sausage that was made from free range antibiotic free chicken and had no MSG in it, you can use whatever your family would typically purchase. I do recommend getting a fresh made sausage from the meat counter though. Not only are they fresher, but I find the flavors to be much richer. 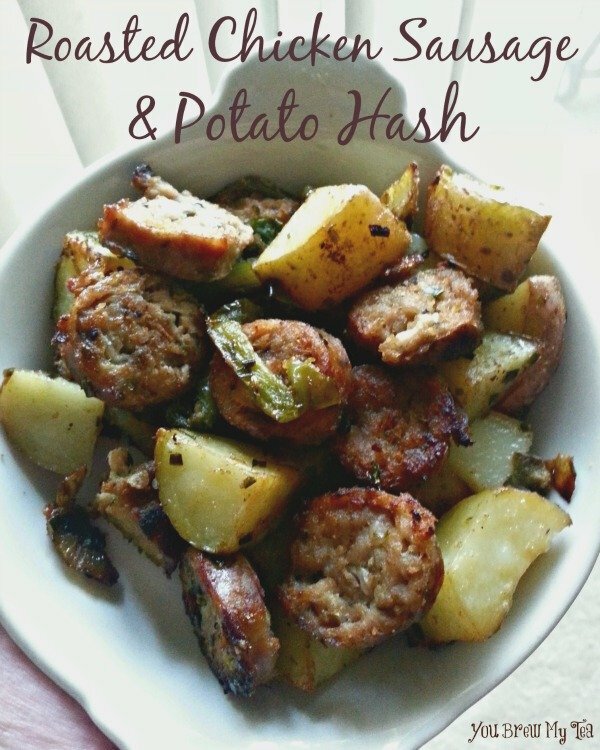 This Roasted Chicken Sausage & Potato Hash is a great option with a side of fresh steamed or roasted veggies as well. We love the fact that it falls so well into our dietary needs and includes so many of our favorite foods in one dish. Weighing in at Only 6 Weight Watchers Points per serving this is also a great meal to add to your menu plan if you are counting points! Wow, this looks really good Katie! Thank you for recipe! This looks and sounds so yummy! I will have to try this very soon! I seriously need to find the nearest Whole Foods and stock up my freezer, no one in my area has chicken sausage. oh looks and sounds great! 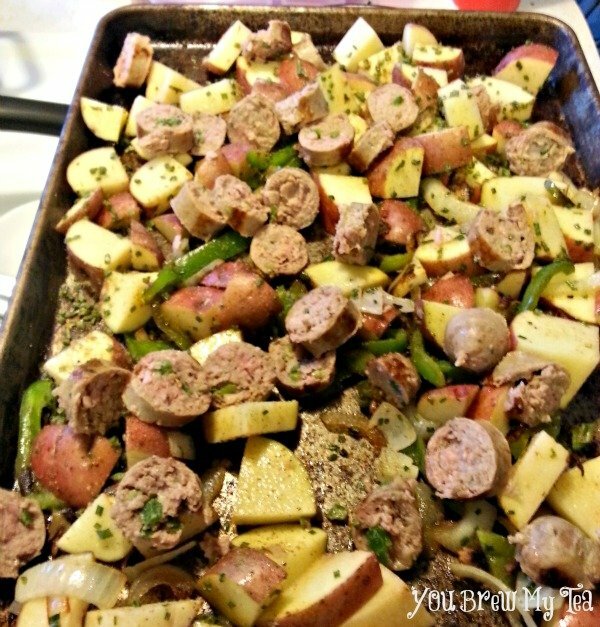 This roasted chicken sausage and potato hash is on the must make! printed and pinned! Yum! This looks delicious! I am making this as soon as I can! Please keep posting stuff like this I really appreciate it! Thank you so much for attending week 17 of #PureBlogLove and linking your fantastic blog post, I can’t wait to see what you have in store for our next party, Thursday 8 PM EST- Sundays at midnight. Your post has been added to the #PureBlogLove Pinterest board for all to see 🙂 Have a great day! Only 20 minutes in the oven? How can the potatoes possibly be tender in such a short time? Has anyone cooked this before? What was your result? With smaller chunks like this, it doesn’t take as long for the potatoes to be tender. Some ovens may cook a bit hotter than others so you can adjust if yours does not cook them enough in that time. Or potentially parboil prior to putting in the oven if you prefer.